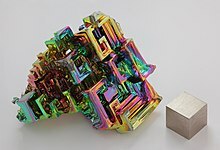 Bismuth was long considered the element with the highest atomic mass that is stable, but in 2003 it was discovered to be extremely weakly radioactive: its only primordial isotope, bismuth-209, decays via alpha decay with a half-life more than a billion times the estimated age of the universe. Because of its tremendously long half-life, bismuth may still be considered stable for almost all purposes. Bismuth compounds account for about half the production of bismuth. They are used in cosmetics, pigments, and a few pharmaceuticals, notably bismuth subsalicylate, used to treat diarrhea. Bismuth's unusual propensity to expand as it solidifies is responsible for some of its uses, such as in casting of printing type. Bismuth has unusually low toxicity for a heavy metal. As the toxicity of lead has become more apparent in recent years, there is an increasing use of bismuth alloys (presently about a third of bismuth production) as a replacement for lead. Bismuth is a brittle metal with a white, silver-pink hue, often with an iridescent oxide tarnish showing many colors from yellow to blue. The spiral, stair-stepped structure of bismuth crystals is the result of a higher growth rate around the outside edges than on the inside edges. The variations in the thickness of the oxide layer that forms on the surface of the crystal cause different wavelengths of light to interfere upon reflection, thus displaying a rainbow of colors. When burned in oxygen, bismuth burns with a blue flame and its oxide forms yellow fumes. Its toxicity is much lower than that of its neighbors in the periodic table, such as lead, antimony, and polonium. No other metal is verified to be more naturally diamagnetic than bismuth. (Superdiamagnetism is a different physical phenomenon.) Of any metal, it has one of the lowest values of thermal conductivity (after manganese, and maybe neptunium and plutonium) and the highest Hall coefficient. It has a high electrical resistivity. When deposited in sufficiently thin layers on a substrate, bismuth is a semiconductor, despite being a post-transition metal. Elemental bismuth is denser in the liquid phase than the solid, a characteristic it shares with germanium, silicon, gallium and water. 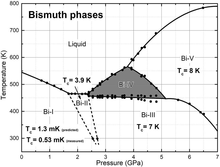 Bismuth expands 3.32% on solidification; therefore, it was long a component of low-melting typesetting alloys, where it compensated for the contraction of the other alloying components to form almost isostatic bismuth-lead eutectic alloys. to be 7026599594400000000♠1.9×1019 years, over a billion times longer than the current estimated age of the universe. Owing to its extraordinarily long half-life, for all presently known medical and industrial applications, bismuth can be treated as if it is stable and nonradioactive. The radioactivity is of academic interest because bismuth is one of a few elements whose radioactivity was suspected and theoretically predicted before being detected in the laboratory. Bismuth has the longest known alpha decay half-life, although tellurium-128 has a double beta decay half-life of over 7031694267200000000♠2.2×1024 years. Bismuth's extremely long half life means that less than one billionth of the bismuth present at the formation of the planet Earth would have decayed into thallium since then. Bismuth oxychloride (BiOCl) structure (mineral bismoclite). 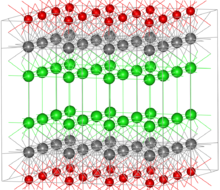 Bismuth atoms shown as grey, oxygen red, chlorine green. According to the United States Geological Survey, the world mining production of bismuth in 2016 was 10,200 tonnes, with the major contributions from China (7,400 tonnes), Vietnam (2,000 tonnes) and Mexico (700 tonnes). The refinery production in 2016 was 17,100 tonnes, of which China produced 11,000, Mexico 539 and Japan 428 tonnes. The difference reflects bismuth's status as a byproduct of extraction of other metals such as lead, copper, tin, molybdenum and tungsten. World bismuth production from refineries is a more complete and reliable statistic. Bismuth travels in crude lead bullion (which can contain up to 10% bismuth) through several stages of refining, until it is removed by the Kroll-Betterton process which separates the impurities as slag, or the electrolytic Betts process. Bismuth will behave similarly with another of its major metals, copper. The raw bismuth metal from both processes contains still considerable amounts of other metals, foremost lead. By reacting the molten mixture with chlorine gas the metals are converted to their chlorides while bismuth remains unchanged. Impurities can also be removed by various other methods for example with fluxes and treatments yielding high-purity bismuth metal (over 99% Bi). 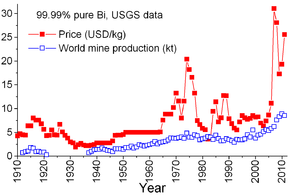 World mine production and annual averages of bismuth price (New York, not adjusted for inflation). Demand for bismuth was small prior to World War II and was pharmaceutical – bismuth compounds were used to treat such conditions as digestive disorders, sexually transmitted diseases and burns. Minor amounts of bismuth metal were consumed in fusible alloys for fire sprinkler systems and fuse wire. During World War II bismuth was considered a strategic material, used for solders, fusible alloys, medications and atomic research. To stabilize the market, the producers set the price at $1.25 per pound (2.75 $/kg) during the war and at $2.25 per pound (4.96 $/kg) from 1950 until 1964. Most bismuth is produced as a byproduct of other metal-extraction processes including the smelting of lead, and also of tungsten and copper. Its sustainability is dependent on increased recycling, which is problematic. It was once believed that bismuth could be practically recycled from the soldered joints in electronic equipment. Recent efficiencies in solder application in electronics mean there is substantially less solder deposited, and thus less to recycle. While recovering the silver from silver-bearing solder may remain economic, recovering bismuth is substantially less so. Next in recycling feasibility would be sizeable catalysts with a fair bismuth content, such as bismuth phosphomolybdate., bismuth used in galvanizing, and as a free-machining metallurgical additive. Bismuth in uses where it is dispersed most widely include certain stomach medicines (bismuth subsalicylate), paints (bismuth vanadate), pearlescent cosmetics (bismuth oxychloride), and bismuth-containing bullets. Recycling bismuth from these uses is impractical. 18th-century engraving of bismuth processing. During this era, bismuth was used to treat some digestive complaints. Bismuth has few commercial applications, and those applications that use it generally require small quantities relative to other raw materials. In the United States, for example, 733 tonnes of bismuth were consumed in 2016, of which 70% went into chemicals (including pharmaceuticals, pigments, and cosmetics) and 11% into bismuth alloys. Bismuth subgallate, the active ingredient in Devrom, is used as an internal deodorant to treat malodor from flatulence and feces. "Milk of bismuth" (an aqueous suspension of bismuth hydroxide and bismuth subcarbonate) was marketed as an alimentary cure-all in the early 20th century. Bismuth oxychloride (BiOCl) is sometimes used in cosmetics, as a pigment in paint for eye shadows, hair sprays and nail polishes. This compound is found as the mineral bismoclite and in crystal form contains layers of atoms (see figure above) that refract light chromatically, resulting in an iridescent appearance similar to nacre of pearl. It was used as a cosmetic in ancient Egypt and in many places since. Bismuth white (also "Spanish white") can refer to either bismuth oxychloride or bismuth oxynitrate (BiONO3), when used as a white pigment. Bismuth vanadate is used as a light-stable non-reactive paint pigment (particularly for artists' paints), often as a replacement for the more toxic cadmium sulfide yellow and orange-yellow pigments. The most common variety in artists' paints is a lemon yellow, visually indistinguishable from its cadmium-containing alternative. Bismuth germanate is a scintillator, widely used in X-ray and gamma ray detectors. Bismuth vanadate is an opaque yellow pigment used by some artists' oil, acrylic, and watercolor paint companies, primarily as a replacement for the more toxic cadmium sulfide yellows in the greenish-yellow (lemon) to orange-toned yellow range. It performs practically identically to the cadmium pigments, such as in terms of resistance to degradation from UV exposure, opacity, tinting strength, and lack of reactivity when mixed with other pigments. 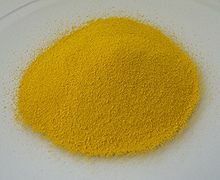 The most commonly-used variety by artists' paint makers is lemon in color. In addition to being a replacement for several cadmium yellows, it also serves as a non-toxic visual replacement for the older chromate pigments made with zinc, lead, and strontium. If a green pigment and barium sulfate (for increased transparency) are added it can also serve as a replacement for barium chromate, which possesses a more greenish cast than the others. In comparison with lead chromates, it does not blacken due to hydrogen sulfide in the air (a process accelerated by UV exposure) and possesses a particularly brighter color than them, especially the lemon, which is the most translucent, dull, and fastest to blacken due to the higher percentage of lead sulfate required to produce that shade. It is also used, on a limited basis due to its cost, as a vehicle paint pigment. ^ a b Cucka, P.; Barrett, C. S. (1962). "The crystal structure of Bi and of solid solutions of Pb, Sn, Sb and Te in Bi". Acta Crystallographica. 15 (9): 865. doi:10.1107/S0365110X62002297. ^ Dumé, Belle (23 April 2003). "Bismuth breaks half-life record for alpha decay". Physicsworld. ^ a b c d e f g h i j k l Kean, Sam (2011). The Disappearing Spoon (and other true tales of madness, love, and the history of the world from the Periodic Table of Elements). New York/Boston: Back Bay Books. pp. 158–160. ISBN 978-0-316-051637. ^ Bismuth. WebMineral. Retrieved on 17 December 2011. ^ Norman, Nicholas C. (1998). Chemistry of arsenic, antimony, and bismuth. p. 41. ISBN 978-0-7514-0389-3. ^ Agricola, Georgious (1955) . De Natura Fossilium. New York: Mineralogical Society of America. p. 178. ^ Nicholson, William (1819). "Bismuth". American edition of the British encyclopedia: Or, Dictionary of Arts and sciences ; comprising an accurate and popular view of the present improved state of human knowledge. p. 181. ^ a b Weeks, Mary Elvira (1932). "The discovery of the elements. II. Elements known to the alchemists". Journal of Chemical Education. 9 (1): 11. Bibcode:1932JChEd...9...11W. doi:10.1021/ed009p11. ^ Giunta, Carmen J. Glossary of Archaic Chemical Terms, Le Moyne College. See also for other terms for bismuth, including stannum glaciale (glacial tin or ice-tin). ^ Pott, Johann Heinrich (1738). "De Wismutho". Exercitationes chymicae. Berolini: Apud Johannem Andream Rüdigerum. p. 134. ^ a b c d e f g h i j Hammond, C. R. (2004). The Elements, in Handbook of Chemistry and Physics (81st ed.). Boca Raton (FL, US): CRC press. pp. 4–1. ISBN 978-0-8493-0485-9. ^ Gordon, Robert B.; Rutledge, John W. (1984). "Bismuth Bronze from Machu Picchu, Peru". Science. 223 (4636): 585–586. Bibcode:1984Sci...223..585G. doi:10.1126/science.223.4636.585. JSTOR 1692247. PMID 17749940. ^ Jones, H. (1936). "The Theory of the Galvomagnetic Effects in Bismuth". Proceedings of the Royal Society A: Mathematical, Physical and Engineering Sciences. 155 (886): 653–663. Bibcode:1936RSPSA.155..653J. doi:10.1098/rspa.1936.0126. JSTOR 96773. ^ Hoffman, C.; Meyer, J.; Bartoli, F.; Di Venere, A.; Yi, X.; Hou, C.; Wang, H.; Ketterson, J.; Wong, G. (1993). "Semimetal-to-semiconductor transition in bismuth thin films". Phys. Rev. B. 48 (15): 11431. Bibcode:1993PhRvB..4811431H. doi:10.1103/PhysRevB.48.11431. ^ a b Wiberg, p. 768. ^ Tracy, George R.; Tropp, Harry E.; Friedl, Alfred E. (1974). Modern physical science. p. 268. ISBN 978-0-03-007381-6. ^ Tribe, Alfred (1868). "IX.—Freezing of water and bismuth". Journal of the Chemical Society. 21: 71. doi:10.1039/JS8682100071. ^ Papon, Pierre; Leblond, Jacques; Meijer, Paul Herman Ernst (2006). The Physics of Phase Transitions. p. 82. ISBN 978-3-540-33390-6. ^ Tiller, William A. (1991). The science of crystallization: microscopic interfacial phenomena. Cambridge University Press. p. 2. ISBN 978-0-521-38827-6. ^ Boldyreva, Elena (2010). High-Pressure Crystallography: From Fundamental Phenomena to Technological Applications. Springer. pp. 264–265. ISBN 978-90-481-9257-1. ^ Manghnani, Murli H. (25–30 July 1999). Science and Technology of High Pressure: Proceedings of the International Conference on High Pressure Science and Technology (AIRAPT-17). 2. Honolulu, Hawaii: Universities Press (India) (published 2000). p. 1086. ISBN 978-81-7371-339-2. ^ a b c d e Suzuki, p. 8. ^ a b Greenwood, pp. 559–561. ". Lettere al Nuovo Cimento. 3 (18): 720. doi:10.1007/BF02824346. ^ Marcillac, Pierre de; Noël Coron; Gérard Dambier; Jacques Leblanc & Jean-Pierre Moalic (2003). "Experimental detection of α-particles from the radioactive decay of natural bismuth". Nature. 422 (6934): 876–878. Bibcode:2003Natur.422..876D. doi:10.1038/nature01541. PMID 12712201. ^ Loveland, Walter D.; Morrissey, David J.; Seaborg, Glenn T. (2006). Modern Nuclear Chemistry. p. 78. Bibcode:2005mnc..book.....L. ISBN 978-0-471-11532-8. ^ Imam, S. (2001). "Advancements in cancer therapy with alpha-emitters: a review". International Journal of Radiation Oncology Biology Physics. 51: 271. doi:10.1016/S0360-3016(01)01585-1. ^ Acton, Ashton (2011). Issues in Cancer Epidemiology and Research. p. 520. ISBN 978-1-4649-6352-0. ^ a b c d e f Godfrey, S. M.; McAuliffe, C. A.; Mackie, A. G.; Pritchard, R. G. (1998). Nicholas C. Norman, ed. Chemistry of arsenic, antimony, and bismuth. Springer. pp. 67–84. ISBN 978-0-7514-0389-3. ^ An Introduction to the Study of Chemistry. Forgotten Books. p. 363. ISBN 978-1-4400-5235-4. ^ a b c d e f Krüger, p. 184. ^ "3D counterpart to graphene discovered [UPDATE]". KurzweilAI. 20 January 2014. Retrieved 28 January 2014. ^ Liu, Z. K.; Zhou, B.; Zhang, Y.; Wang, Z. J.; Weng, H. M.; Prabhakaran, D.; Mo, S. K.; Shen, Z. X.; Fang, Z.; Dai, X.; Hussain, Z.; Chen, Y. L. (2014). "Discovery of a Three-Dimensional Topological Dirac Semimetal, Na3Bi". Science. 343 (6173): 864–7. arXiv:1310.0391. Bibcode:2014Sci...343..864L. doi:10.1126/science.1245085. PMID 24436183. ^ a b Gillespie, R. J.; Passmore, J. (1975). Emeléus, H. J.; Sharp A. G., eds. Advances in Inorganic Chemistry and Radiochemistry. Academic Press. pp. 77–78. ISBN 978-0-12-023617-6. ^ Persson, Ingmar (2010). "Hydrated metal ions in aqueous solution: How regular are their structures?". Pure and Applied Chemistry. 82 (10): 1901–1917. doi:10.1351/PAC-CON-09-10-22. ^ Näslund, Jan; Persson, Ingmar; Sandström, Magnus (2000). "Solvation of the Bismuth(III) Ion by Water, Dimethyl Sulfoxide, N,N'-Dimethylpropyleneurea, and N,N-Dimethylthioformamide. An EXAFS, Large-Angle X-ray Scattering, and Crystallographic Structural Study". Inorganic Chemistry. 39 (18): 4012–4021. doi:10.1021/ic000022m. ^ Anthony, John W.; Bideaux, Richard A.; Bladh, Kenneth W.; Nichols, Monte C. (eds.). "Bismuth" (PDF). Handbook of Mineralogy. I (Elements, Sulfides, Sulfosalts). Chantilly, VA, US: Mineralogical Society of America. ISBN 978-0-9622097-0-3. Retrieved 5 December 2011. ^ Anderson, Schuyler C. "2017 USGS Minerals Yearbook: Bismuth" (PDF). United States Geological Survey. ^ Klochko, Kateryna. "2018 USGS Minerals Yearbook: Bismuth" (PDF). United States Geological Survey. ^ a b Ojebuoboh, Funsho K. (1992). "Bismuth—Production, properties, and applications". JOM. 44 (4): 46–49. Bibcode:1992JOM....44d..46O. doi:10.1007/BF03222821. ^ Horsley, G. W. (1957). "The preparation of bismuth for use in a liquid-metal fuelled reactor". Journal of Nuclear Energy (1954). 6 (1–2): 41. doi:10.1016/0891-3919(57)90180-8. ^ Shevtsov, Yu. V.; Beizel’, N. F. (2011). "Pb distribution in multistep bismuth refining products". Inorganic Materials. 47 (2): 139. doi:10.1134/S0020168511020166. ^ a b c d Bismuth Statistics and Information. see "Metal Prices in the United States through 1998" for a price summary and "Historical Statistics for Mineral and Material Commodities in the United States" for production. USGS. ^ Warburg, N. "IKP, Department of Life-Cycle Engineering" (PDF). University of Stuttgart. Archived from the original (PDF) on 25 February 2009. Retrieved 5 May 2009. ^ a b c Klochko, Kateryna. "2016 USGS Minerals Yearbook: Bismuth" (PDF). United States Geological Survey. ^ Sox TE; Olson CA (1989). "Binding and killing of bacteria by bismuth subsalicylate". Antimicrob Agents Chemother. 33 (12): 2075–82. doi:10.1128/AAC.33.12.2075. PMC 172824. PMID 2694949. ^ Parnell, R. J. G. (1924). "Bismuth in the Treatment of Syphilis". Journal of the Royal Society of Medicine. 17 (War section): 19–26. PMC 2201253. PMID 19984212. ^ Giemsa, Gustav (1924) U.S. Patent 1,540,117 "Manufacture of bismuth tartrates"
^ Maile, Frank J.; Pfaff, Gerhard; Reynders, Peter (2005). "Effect pigments—past, present and future". Progress in Organic Coatings. 54 (3): 150. doi:10.1016/j.porgcoat.2005.07.003. ^ Pfaff, Gerhard (2008). Special effect pigments: Technical basics and applications. Vincentz Network GmbH. p. 36. ISBN 978-3-86630-905-0. ^ Hopper KD; King SH; Lobell ME; TenHave TR; Weaver JS (1997). "The breast: inplane x-ray protection during diagnostic thoracic CT—shielding with bismuth radioprotective garments". Radiology. 205 (3): 853–8. doi:10.1148/radiology.205.3.9393547. PMID 9393547. ^ a b Lohse, Joachim; Zangl, Stéphanie; Groß, Rita; Gensch, Carl-Otto; Deubzer, Otmar (September 2007). "Adaptation to Scientific and Technical Progress of Annex II Directive 2000/53/EC" (PDF). European Commission. Retrieved 11 September 2009. ^ La Fontaine, A.; Keast, V. J. (2006). "Compositional distributions in classical and lead-free brasses". Materials Characterization. 57 (4–5): 424. doi:10.1016/j.matchar.2006.02.005. ^ a b Krüger, p. 183. ^ Llewellyn, D. T.; Hudd, Roger C. (1998). Steels: Metallurgy and applications. Butterworth-Heinemann. p. 239. ISBN 978-0-7506-3757-2. ^ Davis & Associates, J. R. & Handbook Committee, ASM International (1993). Aluminum and Aluminum Alloys. p. 41. ISBN 978-0-87170-496-2. ^ Farahany, Saeed; A. Ourdjini; M.H. Idris; L.T. Thai (2011). "Poisoning effect of bismuth on modification behavior of strontium in LM25 alloy". Journal of Bulletin of Materials Science. 34 (6): 1223–1231. doi:10.1007/s12034-011-0239-5. ^ Farahany, Saeed; A. Ourdjini; M. H. Idris; L.T. Thai (2011). "Effect of bismuth on the microstructure of unmodified and Sr-modified Al-7%Si-0.4Mg alloy". Journal of Transactions of Nonferrous Metals Society of China. 21 (7): 1455–1464. doi:10.1016/S1003-6326(11)60881-9. ^ "BSCCO". National High Magnetic Field Laboratory. ^ Tritt, Terry M. (2000). Recent trends in thermoelectric materials research. Academic Press. p. 12. ISBN 978-0-12-752178-7. ^ Tücks, Andreas; Beck, Horst P. (2007). "The photochromic effect of bismuth vanadate pigments: Investigations on the photochromic mechanism". Dyes and Pigments. 72 (2): 163. doi:10.1016/j.dyepig.2005.08.027. ^ Müller, Albrecht (2003). "Yellow pigments". Coloring of plastics: Fundamentals, colorants, preparations. Hanser Verlag. pp. 91–93. ISBN 978-1-56990-352-0. ^ DiMeglio, John L.; Rosenthal, Joel (2013). "Selective conversion of CO2 to CO with high efficiency using an bismuth-based electrocatalyst". Journal of the American Chemical Society. 135 (24): 8798–8801. doi:10.1021/ja4033549. PMC 3725765. PMID 23735115. ^ Mortier, Roy M.; Fox, Malcolm F.; Orszulik, Stefan T. (2010). Chemistry and Technology of Lubricants. Springer. p. 430. Bibcode:2010ctl..book.....M. ISBN 978-1-4020-8661-8. ^ Croteau, Gerry; Dills, Russell; Beaudreau, Marc; Davis, Mac (2010). "Emission factors and exposures from ground-level pyrotechnics". Atmospheric Environment. 44 (27): 3295. Bibcode:2010AtmEn..44.3295C. doi:10.1016/j.atmosenv.2010.05.048. ^ Ledgard, Jared (2006). The Preparatory Manual of Black Powder and Pyrotechnics. Lulu. pp. 207, 319, 370, 518, search. ISBN 978-1-4116-8574-1. ^ a b DiPalma, Joseph R. (2001). "Bismuth Toxicity, Often Mild, Can Result in Severe Poisonings". Emergency Medicine News. 23 (3): 16. doi:10.1097/00132981-200104000-00012. ^ Fowler, B.A. & Sexton M.J. (2007). "Bismuth". In Nordberg, Gunnar. Handbook on the toxicology of metals. Academic Press. pp. 433 ff. ISBN 978-0-12-369413-3. ^ Data on Bismuth's health and environmental effects. Lenntech.com. Retrieved on 17 December 2011. ^ "Bismuth line" in TheFreeDictionary's Medical dictionary. Farlex, Inc.
^ Levantine, Ashley; Almeyda, John (1973). "Drug induced changes in pigmentation". British Journal of Dermatology. 89 (1): 105–12. doi:10.1111/j.1365-2133.1973.tb01932.x. PMID 4132858. ^ WHO Model Formulary 2008 (PDF). World Health Organization. 2009. p. 62. ISBN 9789241547659. Retrieved 8 December 2016. ^ "Dimercaprol". The American Society of Health-System Pharmacists. Retrieved 8 December 2016. ^ Boriova; et al. (2015). "Bismuth(III) Volatilization and Immobilization by Filamentous Fungus Aspergillus clavatus During Aerobic Incubation". Archives of Environmental Contamination and Toxicology. 68 (2): 405–411. doi:10.1007/s00244-014-0096-5. PMID 25367214. ^ Boriova; et al. (2013). "Bioaccumulation and biosorption of bismuth Bi (III) by filamentous fungus Aspergillus clavatus" (PDF). Student Scientific Conference PriF UK 2013. Proceedings of Reviewed Contributions – via https://inis.iaea.org/search/search.aspx?orig_q=RN:44078325. ^ Carmen Cristina Elekes; Gabriela busuioc (2010). "The Mycoremediation of Metals Polluted Soils Using Wild Growing Species of Mushrooms" (PDF). Engineering Education. Archived from the original (PDF) on 3 March 2016. Retrieved 28 January 2014. Greenwood, N. N. & Earnshaw, A. (1997). Chemistry of the Elements (2nd ed.). Oxford: Butterworth-Heinemann. ISBN 978-0-7506-3365-9. Krüger, Joachim; Winkler, Peter; Lüderitz, Eberhard; Lück, Manfred; Wolf, Hans Uwe (2003). "Bismuth, Bismuth Alloys, and Bismuth Compounds". Ullmann's Encyclopedia of Industrial Chemistry. Wiley-VCH, Weinheim. pp. 171–189. doi:10.1002/14356007.a04_171. ISBN 978-3527306732. Wiberg, Egon; Holleman, A. F.; Wiberg, Nils (2001). Inorganic chemistry. Academic Press. ISBN 978-0-12-352651-9. Wikimedia Commons has media related to Bismuth. Look up bismuth in Wiktionary, the free dictionary.